Are you part of a small corporate team and looking for a unique team building overnight? Spending time in Algonquin Park on our Algonquin Team Building Retreat gives your team a chance to connect away from the office. Our Algonquin Park properties are off-the-grid, providing an ideal setting to bond as a team in an rustic and authentic ‘unplugged’ environment. Instead of staying in yet another hotel room, take your team off-grid for a retreat at the magical Algonquin Log Cabin. Unplug and focus on the authentic. The Algonquin Log Cabin is a rustic lodge located on Surprise lake at Algonquin park’s north west corner. 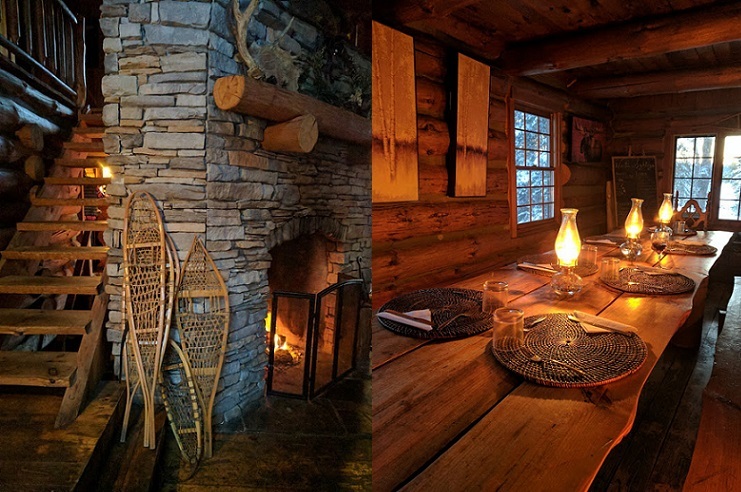 The unique aspect of a 3-day Algonquin Log Cabin adventure is the award-winning guided program and home-cooked local cuisine. Log Cabin adventures are limited to 12-18 people, ideal for a small group looking for an Algonquin Team Building Retreat. Team building programming at the Log Cabin can include canoeing through the mist to look for moose or hiking to forest lookouts. Our Harvest dining room table, lit by candle light and kerosene lanterns, provides an intimate warm environment to feast on delicious home made meals and talk about the days adventure. Discuss your strategy fireside in the large sunken living room. Then hop into a 10 person canoe and paddle to a spectacular campsite for our famous bonfire dinners with local fish and vegetables cooked over an open fire. Team-build programs are tweaked to fit. Create a special menu. Add on a fishing derby, mountain biking,stand up paddle boards or a musician for some live music around the campfire. Disconnect and spend quality time living an authentic adventure in a beautiful outdoor setting. Algonquin is just as spectacular in winter. Come to the park for an Algonquin Team Building Retreat in the snow. Snowshoe and sled on an expedition to a winter camp. Work with a team of huskies as you dogsled across the frozen landscape. Other options for Algonquin Team Building Retreats can include the Algonquin Cottage Outpost, also located at Algonquin’s north west corner, offering solar powered comfort in a beautiful lakeside setting. Contact our office to book your Algonquin Team Building Retreat today. We are able to personalize your retreat to suit your needs. Team building for corporate and school groups in Toronto, Algonquin Park and across Ontario.